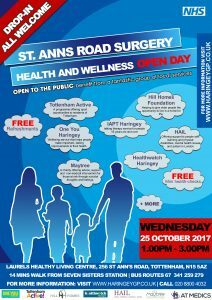 St. Anns Road Surgery will be hosting a Health & Wellness Open Day for all members of the public on Wednesday 25th October 2017 between 1.00pm and 3.00pm – all are welcome to attend. See poster below. The event aims to raise awareness about and allow patients to experience a number of local health and social care service providers accessible through the surgery for our patients as well as other residents of Haringey. Tottenham Active, a programme that offers a range of entry level sport and physical activity opportunities to residents of Tottenham. One You Haringey, a wellbeing service that helps people make important, lasting improvements to their health. IAPT Haringey, a talking therapies service for people 16 years old and over. Hill Homes Foundation, helping to give older people the opportunity to live in a home for life. Maytree, an independent charity that provides a unique, non-medical intervention for those at risk through suicidal thoughts and feelings. A representative from Healthwatch Haringey. HAIL Mental Health, providing professional care and support to people with learning and physical disabilities, mental health issues and autism in London. The Whittington Health Trust Nutrition and Dietetics team, who provide a service to both in and out patients offering advice on dietary intervention for the management of a wide range of clinical conditions. Jason Arthur, the Cabinet Member for Finance & Health (part of Haringey Council’s Cabinet). AT Medics practices schedule regular PPG meetings with SMS reminders, dedicated PPG notice boards and a translator if necessary, and are delighted to be hosting this event at St. Anns Road Surgery. 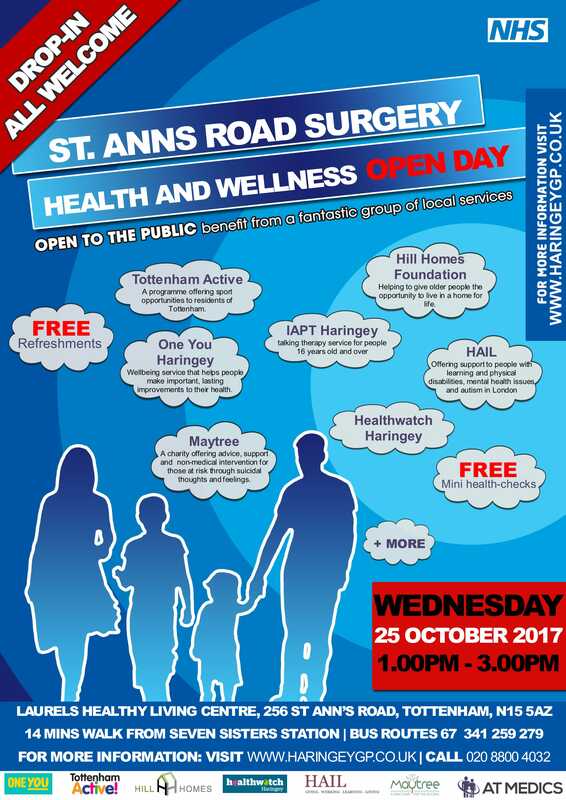 St. Anns Road Surgery is committed to delivering high quality care focused on patient needs and safety, and is working to achieve clinical improvement through the implementation and advancement of quality systems, as well as continually reviewing and investing in training and education of staff.